We’d love your help. Let us know what’s wrong with this preview of The Dragon Dreamer by J.S. Burke. A dying dragon, an undersea misfit, and a dangerous dream. Dive into a new fantasy world! Stand-alone book I of the award-winning Dragon Dreamer series, for young adults 9 to 99. Bullied as a worthless dreamer, Arak flies away on a dangerous quest to prove himself. The young dragon crashes at sea, suffering serious injuries and the loss of his trance-stone. A fearless, shap A dying dragon, an undersea misfit, and a dangerous dream. Dive into a new fantasy world! Stand-alone book I of the award-winning Dragon Dreamer series, for young adults 9 to 99. Bullied as a worthless dreamer, Arak flies away on a dangerous quest to prove himself. The young dragon crashes at sea, suffering serious injuries and the loss of his trance-stone. A fearless, shape-shifting octopus named Scree heals him, and an unexpected friendship begins. Arak returns to the Winter Festival, where dragons carve glaciers with fire and toss lightning bolts in the clouds. But a deadly illness stalks the clan. Then an undersea volcano erupts, which triggers a towering tsunami and a deadly chain of events. How can Arak turn his dangerous dream into a solid plan to save the dragons? To ask other readers questions about The Dragon Dreamer, please sign up. This is an extremely unique book that combines action and adventure with a deep understanding of real ocean life and a highly imagined dragon world. It is both fascinating and educational. For anyone who has ever been curious about the mysteries of the depths or enchanted with dragons, this book will engage you. If you are drawn to both, the Dragon Dreamer will become your favorite book ever. When I saw this book had over 50 reviews and a 4.9 rating I was skeptical. After reading The Dragon Dreamer I now know why. It only has a 4.9 rating because we can't give it 6 stars. Yes, it's that good. There are too many authors who seem to see how 'dark' they can be. Or how many bad choices they can have their characters make and still have them look good at the end. This is a story that shows the positive. The main characters have their flaws but unlike so many times where the Need more stars. This is a story that shows the positive. The main characters have their flaws but unlike so many times where the character routinely makes bad choices, our two main characters are intelligent and positive ... well, except for the obligatory relationship thing. Besides the overall good science, the part I liked best was the language of the octopi. I won this on GoodReads. “The Dragon Dreamer” is a lovely story about using the gifts you were born with and how people can still be good friends even if they look different then you. This is designed for a younger reader (middle school? maybe younger) with a glossary in the back for words they may not know. Arak is a young dragon with a talent to mind-trance. The other young dragons tease him and call him a “dreamer”. After an accident he is injured and is nursed back to health by something he h I won this on GoodReads. “The Dragon Dreamer” is a lovely story about using the gifts you were born with and how people can still be good friends even if they look different then you. This is designed for a younger reader (middle school? maybe younger) with a glossary in the back for words they may not know. Arak is a young dragon with a talent to mind-trance. The other young dragons tease him and call him a “dreamer”. After an accident he is injured and is nursed back to health by something he had never imagined, a young healer named Scree, who happens to be an octopus. And this, as they say, was the beginning of a wonderful friendship. A dying dragon, an undersea misfit, and a dangerous dream. Arak is bullied as a worthless dreamer. Determined to prove himself, the young dragon leaves on a quest, flies far over the sea, and crashes. Badly wounded, he faces death. A fearless, shape-shifter octopus named Scree finds and heals him, and an unexpected friendship begins. Arak returns to the Winter Festival, where dragons carve glaciers with fire and toss lightning bolts in the clouds. But a deadly illness stalks the dragon clan. Then an undersea volcano erupts, which triggers a towering tsunami and a deadly chain of events. Dragons and their undersea friends are dying. How can Arak use his unique gifts to save the dragons? This was a cute and in many ways surprising tale. Who would have thought about story of a friendship between a dragon and an octopus would be so incredibly interesting? Well, obviously, the author did, because she did a fantastic job of weaving a fanciful story with actual facts about 0ctopi and other marine life. I adored all the characters. The Dragon Dreamer by J. S. Burke is definitely NOT just another dragon story. As I began to read, I was confused about how a dragon and an octopus could become friends. By the end of the first chapter, I had taken the bait and was hooked. The storyline is creative and original, a fantasy tale with similarities to real life. The book is a beautiful story, a fun, whimsical read and a smart read all in one, not easy to accomplish. It is appropriate for all ages, including adults. Arak is a young dragon who feels different from the rest of his clan and is teased for his unique gift. Through an accident, Arak encounters Scree, a wise and open-minded octopus, and the healer for her pod. They learn to communicate with body and sign language and become friends, and soon clan and pod are interacting, trading goods, exchanging stories, learning about another culture, and building many more friendships. The pod, clan and individuals of each experience various issues. First, as mentioned, are Arak’s feelings about being different, and how he handles the teasing and bullying from other dragons. Second are the interactions between two very different cultures (“sky swimmers” vs. ocean dwellers) who learn that they aren’t so different at all. Additionally, Arak has begun to develop feelings for Zarina, someone he’s always been friends with but who is now a dragon-lady. I was pleased to see this in the book, as I feel that it is beneficial to be friends before growing a relationship. Each culture has their issues to contend with at home. The dragons suffer a severe health issue and Arak is desperate to find a solution. The octopi pod endure an attack which provides Scree with a unique opportunity to put her talents and personality to an all new, extremely dangerous, test. Other lovely themes grace the novel, but I don’t want to reveal all to other readers. The adventures are exciting and keep you turning the page. The book is very well written. The author is a marine biologist and includes actual characteristics of octopi and other creatures of the ocean. She creates wonderful attributes for the dragon clan that seem incredibly realistic. I hope there will be a sequel, because I would love to read more. I loved it. As I read I ran across several quotes that I particularly like. Most children I know age 8 and up could read it without any trouble, and certainly 10 and up. If a reader has any trouble with vocabulary, there is a glossary in the back, which also includes information about the sea life. If it is above the child’s reading level, it would be a wonderful book to read to your child. I also agree with other reviewers who suggest that this would make a great movie. It is a new and original concept with the opportunity to produce some beautiful imagery, scenery and action. Disney? DreamWorks? I hope you’re paying attention, because I would love to see this in the movie theater. I enjoy reading authors from Georgia and added The Dragon Dreamer by J S Burke to my TBR not long ago. Read on to discover my thoughts! Synopsis (from the author): The Dragon Dreamer is a fast-paced adventure with flying dragons, an undersea world, and an unlikely friendship. It's a science fantasy layered for readers age 9 to 99. Arak is a misfit dragon called "Dreamer". Determined to prove himself he leaves on a dangerous quest, is caught in a fierce sea-storm, and crashes on ice. Wounded and al I enjoy reading authors from Georgia and added The Dragon Dreamer by J S Burke to my TBR not long ago. Read on to discover my thoughts! Arak is a misfit dragon called "Dreamer". Determined to prove himself he leaves on a dangerous quest, is caught in a fierce sea-storm, and crashes on ice. Wounded and alone he faces death. Then a fearless undersea shape-shifter named Scree heals him and an unlikely friendship begins. When an undersea volcano erupts it triggers a towering tsunami and a deadly chain of events. Can Arak use his unique talents to save the dragons? What I liked: The Dragon Dreamer was a fun read, and I learned quite a bit about octopuses, squids, and, of course, dragons. I enjoyed the way J S Burke mingled fantasy, science, and science fiction into the story. Arak, our dragon hero, persevered through bullying and teasing. Scree, the octopus, was a bold adventurer, and together they bring their respective cultures together to help one another and improve life for both. Lots to learn here! What I didn’t like: To be honest, I really didn’t find anything to dislike in this book. Overall impression: The Dragon Dreamer by J S Burke was a good read. Written for ages 9-99, the story is easy to follow, deals with issues many young people encounter, and showed that a positive attitude can go a long way to making life better. Well done J S Burke! J.S. Burke has managed, and with great success, to build a world that young readers will find a sheer delight to explore! While reading this novel I shared passages with my ten year old daughter and she was thrilled with the surprising friendship between Arak the dragon and Scree the octopus. Both characters have so much to offer! Arak is a dreamer who deals with his own self-doubt as well as a bullying dragon, his first brush with love, and his overwhelming desire to help his community of drago J.S. Burke has managed, and with great success, to build a world that young readers will find a sheer delight to explore! While reading this novel I shared passages with my ten year old daughter and she was thrilled with the surprising friendship between Arak the dragon and Scree the octopus. Both characters have so much to offer! Arak is a dreamer who deals with his own self-doubt as well as a bullying dragon, his first brush with love, and his overwhelming desire to help his community of dragons find a viable food source. Scree is a healer and, unlike her mate Orm and the other octopi, she seeks adventure and is always guided by the desire to help and do what is right. Another great read - I seem to be going backwards, but siince I usually have 3 or 4 books on the go, I always know where I am. I am enthralled by the Octopusses and Dragons and their relationships. The two books in this series are great for an afternoon read or to hand over to my granddaughter who loves the sea and a good read. "Everything worth doing starts with a dream," says Arak, one of the main characters in J.S. Burke's wonderfully imaginative novel, "The Dragon Dreamer." On the surface, this is a fantasy book aimed at middle grade readers about a young dragon, Arak, who, after crash landing on an ice floe, is nursed back to health by an octopus healer, Scree, and the friendship that develops between them and their respective species. But it is a story that can be read on multiple levels and by multiple ages. Alth "Everything worth doing starts with a dream," says Arak, one of the main characters in J.S. 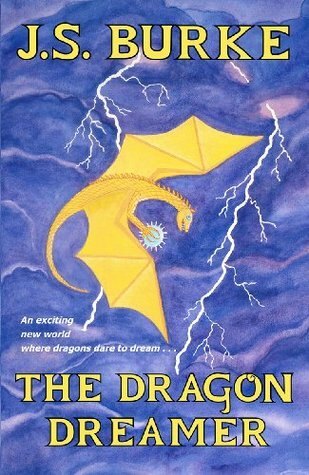 Burke's wonderfully imaginative novel, "The Dragon Dreamer." On the surface, this is a fantasy book aimed at middle grade readers about a young dragon, Arak, who, after crash landing on an ice floe, is nursed back to health by an octopus healer, Scree, and the friendship that develops between them and their respective species. But it is a story that can be read on multiple levels and by multiple ages. Although there are no mentions of humans in this book, the characters have human qualities, experience human emotions, and face human dilemmas that are easy to relate to. Arak belongs to a race of dragons that is dependent on copper for health. His clan is running dangerously low, leading to widespread illness, so he sets out (on his maiden flight, no less), to find the clan a new copper source. Arak, who is young, inexperienced, but believes in something bigger than himself, makes an unlikely yet solid fantasy hero that readers can all root for. He longs for recognition from his clan and the female dragon of his heart's desire but is scoffed at for his dreams. Scree, the brave female octopus who has dedicated her life to helping others (whether they are from the same species or not) and Orm, her research scientist mate with the dry sense of humor, round out the cast of main characters. The relationship that develops between dragons and octopi, with mutual trading of goods, information, and protection is reminiscent of how human groups form alliances. It provides a wonderfully allegorical way of introducing diplomacy with those that are outwardly different in appearance (probably something certain political leaders could benefit from reviewing). Beneath the tale of friendship between members of different species, there are a number of other deeper themes operating below the surface: 1.) the dragons' constant and sometimes fruitless quest for copper to ensure their own survival, paralleling the neverending human search for energy, 2.) the difficulty that medical professionals face in achieving work-life balance, hinted at a number of times in the lives of Scree and Zarina (Arak's love interest), who make personal sacrifices that, at times, make them doubt their career choices, 3.) the importance of communication and mutual respect means of avoiding conflict, as evidenced by Scree's brave attempts to understand and bridge the gap with the feared giant squid, predators of octopi, 4.) the impact on an ecological system when one part is disturbed, as evidenced by the sudden aggression shown by the dragons' neighbors when their food supply dwindles, and 5.) the importance of not letting naysayers destroy one's dreams, as shown by Arak's quote above and his continual search for copper in spite of overwhelming odds. The author's love of the sea is apparent throughout the book, as the descriptions of undersea life are vivid and easily stoke the imagination. Her love of chemistry is as well, as there are many bits that add depth to the book's world. For example, since the dragons are so short on copper, they turn to turquoise rock (which has traces of copper) as a poor substitute. There are also charming M.C. Escher-like line illustrations, generally in the shape of snowflakes made of repeating stylized versions of creatures from the book. They are sprinkled throughout and complement the story nicely. In addition, the author has a glossary at the end to help younger readers with the pronunciation and definition of some of the bigger words – all done using examples from the story, which is a nice touch. All in all, this is an enchanting book that is not only a great adventure story but provides a nice way to begin talking about topics such as conflict between groups of people, the importance of understanding other cultures before passing judgment, and the importance of dreaming big and not giving up. Given its depth, it could easily be read and enjoyed by a young adult population as well. I'm looking forward to seeing what lies in store for Arak, Scree, and Orm in the future. The Dragon Dreamer is a deeply imaginative fantasy about the unlikely friendship between a dragon, Arak, and an octopus, Scree. Filled with tales of trance-minds, octopus skin pictures, undersea volcanoes, shark attacks and battles with giant squid, it offers plenty to feed and inspire young imaginations. As unlikely as Arak and Scree’s friendship may be, J.S. Burke succeeds at making it completely believable. Scree is a brave, adventurous healer with a caring, cautious mate, Orm. The contrast be The Dragon Dreamer is a deeply imaginative fantasy about the unlikely friendship between a dragon, Arak, and an octopus, Scree. Filled with tales of trance-minds, octopus skin pictures, undersea volcanoes, shark attacks and battles with giant squid, it offers plenty to feed and inspire young imaginations. As unlikely as Arak and Scree’s friendship may be, J.S. Burke succeeds at making it completely believable. Scree is a brave, adventurous healer with a caring, cautious mate, Orm. The contrast between these two octopi serves to deepen their characters. I really like Scree. She is smart, courageous and confident. When several dragons become severely ill from copper deficiency she simply says, “What would be would be. And then she’d fix it.” She meets Arak when she heals him after a terrible accident. Arak is a dreamy wanderer who is made fun of for going against the grain. He is filled with self doubt. “Dragons knew storms,” the narrator tells us. “They danced with storms! Yet he’d missed the signs, and this one almost killed him.” Young readers will be able to identify with this self-doubt, and with the crush Arak has on his love interest, Zarina; his fear of Karoon, the bully; and his longing to prove to the world what he is capable of. J.S. Burke’s prose is impeccable and has a rhythmic, lapping quality to it, much like the sea or the waving octopus arms she describes. Chapter names like “The Sea Boils” and “A Dangerous Game” heighten the suspense and make readers want to continue. The book also contains several intricate snowflake drawings which add to the mystery and beauty. This is a beautifully woven tale about a chance meeting between an injured Dragon and an Octopus.. Arak is a dragon and known as a dreamer by his peers and picked on for his tendencies to zone out so to speak, Scree is an octopus healer who yearns for travel and adventure. Arak crash lands on the ice while trying to find copper to save his family and friends. Scree finds him too injured to fly and in need of a healer. In the most creative of ways the author spins a tale of friendship formed by t This is a beautifully woven tale about a chance meeting between an injured Dragon and an Octopus.. Arak is a dragon and known as a dreamer by his peers and picked on for his tendencies to zone out so to speak, Scree is an octopus healer who yearns for travel and adventure. Arak crash lands on the ice while trying to find copper to save his family and friends. Scree finds him too injured to fly and in need of a healer. In the most creative of ways the author spins a tale of friendship formed by two very unlikely beings. The author has created an enchanting story for all readers whether you’re a child or merely young at heart. Her style of writing is like an artist painting a picture of watercolors all blending together to create one splendid work. The Dragon Dreamer is a charming adventure that includes a highly unlikely friendship between a wounded dragon, Arak, and his healer a lovable octopus named Scree. During the time it takes for Arak to heal, they form an unbreakable bond. Arak is labeled a dreamer by his fellow dragons and isn’t taken very seriously until a plight threatens their very existence and sets him on a quest that will change the way his peers view him from then on, but the one whose opinion means the most seems to be beyond his grasp, his beloved Zarina. J.S. Burke, is a marine biologist and teacher whose great imagination, mixed with her knowledge of marine life has woven fantasy and fact into a tapestry so engrossing that it becomes difficult to tell where fiction ends and reality begins. The Dragon Dreamer is a fresh, positive fantasy about a Dragon who gets rescued by an Octopus. Both beings are sentient. The two become friends, bring their two cultures into friendship, and then cooperate to solve several problems weighing down on their respective communities. Burke’s touch is very light, but she gives in-the-moment explorations of a host of heavy topics - friendship, courtship, trust, empathy, sympathy, bravery, all bolstered by real-world science and solid reasoning. It makes The Dragon Dreamer is a fresh, positive fantasy about a Dragon who gets rescued by an Octopus. Both beings are sentient. The two become friends, bring their two cultures into friendship, and then cooperate to solve several problems weighing down on their respective communities. Burke’s touch is very light, but she gives in-the-moment explorations of a host of heavy topics - friendship, courtship, trust, empathy, sympathy, bravery, all bolstered by real-world science and solid reasoning. It makes for a surprising, reassuring read. Very gentle, very calm, but easy to admire and approve of. This is not a children’s book, BUT about halfway through, I got very excited by the idea that it is an almost perfect book for a child ready to read on their own. It doesn’t talk down to its readers, but all its concerns are real world concerns dressed in the fantastic - though even the fantastic elements are confined by logic. Assume Dragons are real, how would they make things? how would they provide for themselves, how would they interact with others? Ask the same questions about a community of fully sentient octopi, and you will have a hint about this book. Add to that, that the book is always about the fostering of cooperation, for instance, Dragons needing copper is a fantasy. How to hunt down copper in turquoise and certain seaweeds is eye-opening scientific fact, provided to the Dragon (named Arak) as a result of his new friendship with the Octopus healer (named Skree). That is the book’s general model: a fantastic problem is introduced, and then solved using real-world science and thoughtful reasoning. I wish I knew about this book when my children were young, I would have LOVED sharing it with them. (or having them share it with my wife and me). The book is easy to digest, there are large scale arcs that span the story, and many smaller problems that are dealt with in the same chapters they are introduced - so this would be an excellent book for bedtime stories (You read a chapter, there is closure, and maybe even a discussion to have before sleep). The book is also FULL of lovely notions about art. We get very inventive concepts of how Dragons might make artifacts -- combining sandcasting, lightning, and tree sap. We get Octopi making murals using colorful lichen. We get pictogram language using pigment cells on the bodies of the Octopi, and we get beautiful origin legends relayed for both tribes. Do you have a kid who might be ready to read on their own? Who likes animals, and friendship, and who wouldn’t mind continually having smart things to tell the family? Get them this book! or by all means, enjoy it on your own. The author's fascination with sealife is obvious, and it is intriguing how she intertwines it with the dragon world. There is so much lovely detail in the descriptions, and almost a science to it. I enjoyed the author's comparison of the daily rituals of sea and dragon life with the human perspective. In fact, most of the stor Combining two of my most favourite elements, the ocean and fantasy, has certainly not put this author in an easy spot with me as a reader. My expectations were really high. The author's fascination with sealife is obvious, and it is intriguing how she intertwines it with the dragon world. There is so much lovely detail in the descriptions, and almost a science to it. I enjoyed the author's comparison of the daily rituals of sea and dragon life with the human perspective. In fact, most of the story can be taken as a metaphor to our world, even the environmental issues, conflict and the importance of stories for the growth of a species. Although there are absolutely no human characters in this story (which took some time for me to get used to), all the characters and their relationships are developed well, with lots of love and respect. The weather threats and action sequences are intense, but it is the life described that I particularly enjoyed. This entire world has been created with amazing consistency and attention to detail. The admirable symbiosys of skills from completely different creatures, shows us how humans should learn, united by a common goal - life on this planet. And how interesting it is that the author has both species celebrate and encourage art, creativity and healing, in contrast to humans! Dreamers they are, truly. What I especially liked in the story is the strong emphasis on learning and communication - each species can learn from another when willing to communicate. Arak is a dragon, but he's not like the other dragons. He has a gift that makes him different, and being different is never easy. Wanting to gain acceptance among the other dragons, he sets off on his own to try to help his people and ends up in trouble. Which is when he meets Scree and a beautiful friendship is born. Will these two exceptional individuals overcome all the challenges ahead and succeed in helping their people? You'll have to read to find out! I loved, loved, loved this story. I li Arak is a dragon, but he's not like the other dragons. He has a gift that makes him different, and being different is never easy. Wanting to gain acceptance among the other dragons, he sets off on his own to try to help his people and ends up in trouble. Which is when he meets Scree and a beautiful friendship is born. Will these two exceptional individuals overcome all the challenges ahead and succeed in helping their people? You'll have to read to find out! The Dragon Dreamer is a fantastic tale of adventure, intrigue and relationships revolving around two disparate cultures: Dragons and Octopi. How the dragon Arak learns to interact with the octopus Scree is both enlightening and extraordinary, but is a great example of how two diversely different communities can come together and mutually benefit each other. The author has a magnificent grasp of sea life, and her experience and expertise shine throughout this magnificent tale. Reading The Dragon D The Dragon Dreamer is a fantastic tale of adventure, intrigue and relationships revolving around two disparate cultures: Dragons and Octopi. How the dragon Arak learns to interact with the octopus Scree is both enlightening and extraordinary, but is a great example of how two diversely different communities can come together and mutually benefit each other. The author has a magnificent grasp of sea life, and her experience and expertise shine throughout this magnificent tale. Reading The Dragon Dreamer brought to mind many of the wonderful animated feature-length movies that have come out of Disney, and I would venture to say The Dragon Dreamer is an excellent story for that venue. I hope someone takes notice of how rich and masterfully told this story is. The Dragon Dreamer is a lovely flight of fantasy, of dragons & octopi, that is chock full of adventure, adversity, and the joy of new found friends. A blend of make-believe & real scientific facts, this book is a wonderful read no matter what age you are. A wonderful fantasy for adults as well as children. Full of imagery, imagination and facts about the world under water. I loved this book and highly recommend it for the young, or young at heart. Not something I would normally pick up but I am now a J. S. Burke fan. A fantastic tale which is woven with dynamic characters and brilliant scenery. This book is one for all ages, you can read it yourself, with your children or with your grandchildren. It is a fantasy built for all ages. A Feast for the Imagination! In this marvelous book, J. S. Burke creates a world so vivid we can taste colors, smell feelings, see music, and feel flavors. With her artistic use of imagery the words sing. And what a song ~ of friendship, love, grief, fear, anguish, hope, and, yes adventure. The story of Arak, a young dragon full of dreams and Scree, a philosophical octopus-healer, sounds unlikely. So did the story of a talking spider or a farm whose animal society represents a microcosm of our own A Feast for the Imagination! The story of Arak, a young dragon full of dreams and Scree, a philosophical octopus-healer, sounds unlikely. So did the story of a talking spider or a farm whose animal society represents a microcosm of our own. Yet CHARLOTTE'S WEB and ANIMAL FARM are two icons of 'children's literature' because their language speaks to both children and adults alike. I see this in THE DRAGON DREAMER. The characters and storyline are so well drawn we are hopelessly hooked in the very first chapter and held captive throughout the whole book. Dragons grow intricately patterned snowflakes, carve story-telling ice sculptures, and dance with the clouds. The octopi create living murals using tiny glowing sea creatures, build "tentacle artwork" from driftwood that stimulate all their senses, and they speak with colors. Burke throws these two unlikely societies together who find their way through adversity to a deep, abiding friendship/alliance. The beautiful metaphors, philosophy, and imagery evoke a style reminiscent of Andre Norton and Mercedes Lackey. This enchanting story also weaves in science, politics, and social awareness. I bought a copy for my granddaughter and one for my grandson, and I intend to read it again. Over and over. When the sequel comes out--I do hope we get to meet the mythical/legendary ice dragons--I will buy it as well. This is a world for anyone who wants a journey into fantasia while enjoying valuable life observations and science-based realism. I highly recommend it for all ages but parents beware! Your child WILL learn while having fun. On a personal note, I would like to add that this book came into my life during a particularly difficult crisis ~ it saved my sanity. I read for one magical hour each night and "flew the oceans" in my mind with Arak and Scree all the next day. Finally, in the book if a Dragon likes something they call it art. I call THE DRAGON DREAMER more than art ~ it's like a geode. Crack it open and discover the sparkling world within. If you do, I promise you will "surf the tangled currents of the sea (and sky) forever." I rec'd an ARc of this book from the author J S Burke in exchange for an honest opinion. This is mousiey's and her nieces very honest opinion of the book. This is the first book which either one of us have read of this author. And found it to be very interesting and a fast paced book. The Dragon Dreamer is written for children ages of middle school. It tells the story about a Dragon who upon his first flight has an accident and relies on a healer from another sea creature to make him better. This I rec'd an ARc of this book from the author J S Burke in exchange for an honest opinion. This is mousiey's and her nieces very honest opinion of the book. This is the first book which either one of us have read of this author. And found it to be very interesting and a fast paced book. The Dragon Dreamer is written for children ages of middle school. It tells the story about a Dragon who upon his first flight has an accident and relies on a healer from another sea creature to make him better. This tells the journey of 2 such animals an their friendship that they build together. How they each help each other over come issues and problems within there own families. In a way - it helps teaches our children that we must all work together to over come all things. And that we can make friends outside of our race or breed of animal- ex-- cat and dog make friends an live together as one unit, forest animals all reside together and get along with each other. I recommend this book for children in middle school. Our rating for this very inspiring, interesting - moving and compelling story is a 30 out of 5 stars. Ms Burke has a wonderful way of bringing her special characters to life and has an amazing imagination. Both myself and my lovely teenage niece are very honored to have been able to read her book. Arak, a young dragon heading out for his first solo journey, encounters a terrible storm and finds himself stranded on the ice. Alone and seriously hurt, he wonders if he will ever make it home. He is embarrassed that if he does, he will be teased for messing up. He is shivering and suffering from a torn wing and injured leg when a strange creature approaches. Fearful, but unable to flee, Arak learns this being is an octopus named Scree, who is a healer. She tends to his wounds and feeds him, an Arak, a young dragon heading out for his first solo journey, encounters a terrible storm and finds himself stranded on the ice. Alone and seriously hurt, he wonders if he will ever make it home. He is embarrassed that if he does, he will be teased for messing up. He is shivering and suffering from a torn wing and injured leg when a strange creature approaches. Fearful, but unable to flee, Arak learns this being is an octopus named Scree, who is a healer. She tends to his wounds and feeds him, and they discover a way to communicate and become friends. Scree and her mate Orm care for Arak, and the dragon is mesmerized by their ability to alter their bodies to display colorful and whimsical images. The weather clears and Arak is healed enough to return home. The octopi pod and dragon clan become friends and help each other survive many dangers. Scree shows her lack of fear when a shark attacks near their pod, and she unflinchingly goes to the rescue. Though the two are opposites, Orm and Scree complement each other. The differences between the characters are vividly displayed, adding a mystical aspect to this delightful tale. The way the author describes the undersea world and portrays each character in a special light puts a human aspect to the story. The secrets of underwater creatures are exceptional and a joy for adults as well as kids. Each chapter commences with an illustration or enchanting drawing. Also, J.S. Burke includes a glossary giving descriptions of different and unusual terms used in the text. This story is not only a fantasy, but offers lessons in friendship and how each being is special in their own way. The story shifts between two groups: the golden dragons who are in danger because their life-giving copper supplies are running low, and the octopuses who live on undersea reefs. The main protagonists, Arak, the dragon, and Scree, The author of this book is multi-talented. She is a marine biologist, teacher, chemist, artist and geologist. In this book targeted for middle grade students, she somehow manages to weave these disparate elements together in a well-written educational fantasy adventure. J. S. Burke is an author, artist, and marine biologist, studying creatures of the dark abyss and diving on coral reefs. Her stories blend imagination with real science and author experiences: raging sea storms, waterspouts, sunset waves. The award-winning Dragon Dreamer series grew from years at sea, a fascination with clever, alien octopuses, and a love of dragons. It's Science Fantasy Adventure J. S. Burke is an author, artist, and marine biologist, studying creatures of the dark abyss and diving on coral reefs. Her stories blend imagination with real science and author experiences: raging sea storms, waterspouts, sunset waves. The award-winning Dragon Dreamer series grew from years at sea, a fascination with clever, alien octopuses, and a love of dragons. It's Science Fantasy Adventure with dragons and an undersea world for young adults 9 to 99. Burke loves chocolate and so do the dragons! They grow snowflakes with wildlife designs for the Winter Festival (see Fantasy Snowflakes Coloring Book). "Dragon Lightning" won PINNACLE First Place for Best Science Fantasy and IAN First Place for Best Science Fiction. It's also an IAN Finalist for Best Fantasy and Best Young Adult book. "The Dragon Dreamer" won IAN First Place for Best First Novel. It's also an IAN Finalist for Best Science Fiction and for Best Fantasy. Favorite books include Lord of the Rings, Dune, Watership Down, The Crystal Cave, Silent Spring, and many more!